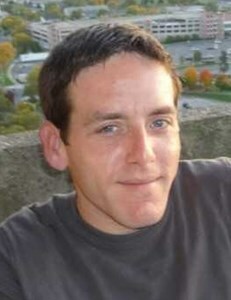 David J. Mulligan, 37, of Syracuse, passed away on March 30th. David was a hard worker but in his spare time he enjoyed travelling with his family and reading books. He was predeceased by his parents, David and Robin Mulligan and sister, Rachel Mulligan. David is survived by his daughter, Kady Mulligan; twin brother, Daniel Mulligan; mother to his daughter, Tracy Cashier and many aunts, uncles and cousins. A calling hour will be held on Friday, April 5th 4-5pm at New Comer Cremations & Funerals with a service to follow at 5pm. To share a memory of David or leave a special message for the family, please click the Share Memories button above. Add your memories to the guest book of David Mulligan. We remember David fondly and are very sorry for your loss. Our deepest condolences. I have so many memories with the Mulligan family that I cannot pick any that are better than another. I remember when Dave showed up to school with a broken arm and then a few days later, he had another cast on his other arm too. We all had a good laugh about it. I hope Dave's last walk was straight up to heaven. He certainly deserves it. I had the great pleasure of working with him for the last several years. He was always honest, ready to do anything for anybody and was just an all around great guy to be with before, during and after work. I was proud to call him my friend. All of us here at work will miss him dearly. He was one of the anchors of the company. We all called him DD. Short for Designated Dave. I never thought he would leave us so early. My thoughts and prayers are with his family. I hope you will all find some measure of peace and be able to move on. Dave would want it that way. I am so very sorry for your loss Tracy and Kady . My heart is aching for you both. May he rest in peace . I’m really sad about Dave passing. I’ll miss him. The truth is, I’ve already been missing him a long time. He was the first person I called my best friend. Although we hadn’t been in touch much for a long time, whenever I would see him I didn’t ever feel that we weren’t still close. Dave was a really good friend, not just to me, he was really good at being a friend. I’m deeply saddened by his untimely passing. I’m praying for you Dave and I hope to see you in Heaven. My thoughts and prayers to Dave's family. I knew Dave briefly while working together at Detail Office. We had many laughs together while Dave's smile would light up a room! Dave was a tremendous worker while being very thoughtful and caring towards everyone. Dave was especially proud of his daughter. Dave, I will miss you and may God bless you forever.